Should Wisconsin Businesses Boycott Fox Cities Sign & Jim Marks? The Menasha, Wisconsin-based Fox Cities Sign & Lighting is accused of stealing and destroying $21,000 worth of signs owned by a local small business. 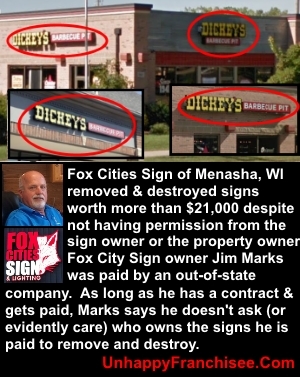 Fox Cities owner Jim Marks admits to removing & destroying signage on behalf of out-of-state companies. He’s accused of unethical and potentially illegal conduct. This is Part 1 of a series. A week before Christmas, you get a call that all of your exterior signage has somehow disappeared from your building. Overnight, the signage you paid thousands, if not tens of thousands of dollars for, is gone. Vanished. Since the thieves must have been professionals, you start calling local sign companies and one admits that it was paid to have a crew secretly remove your signs and destroy them. The owner said he got paid from an out-of-state company and doesn’t care who owns the signs he just destroyed. In fact, he threatens to sue YOU for complaining online. As unbelievable as that sounds, this is exactly what happened to an Appleton couple who owned two franchised barbecue restaurants in Appleton and Green Bay, Wisconsin. Last year, about a week before Christmas, the couple received word that exterior signage they had paid over $21,000 to install had been removed from their two businesses and immediately destroyed. The crews must have worked at night, they believe, because no one seemed to see them access the premises, turn off the electricity, and remove the extensive and expensive signage. Through their own sleuthing, they discovered that Fox Cities Signs of Menasha, WI, acting on behalf of an out-of-state company the franchise owners are in a dispute with, had been paid to steal and destroy the signage that they had spent more than $21,000 to install. 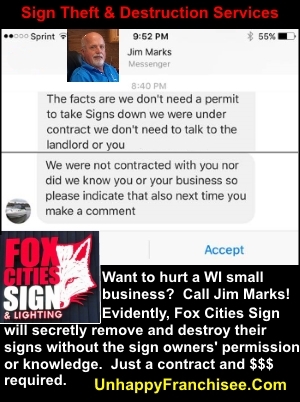 When they contacted Fox Cities Sign owner Jim Marks, he was nasty, belligerent and threatened them with legal action because they had complained online. When UnhappyFranchisee.Com contacted him, Fox Cities Sign owner Jim Marks did not dispute the fact that his company removed and destroyed the signage, and that he has done so to other small businesses in the past. Marks stated that he doesn’t ask out-of-state clients for proof that they own the signs, or that they have the legal authority or permission to access the property or remove the signage. As long as Fox Cities Sign has a contract and gets paid, Marks is content. The couple has furnished UnhappyFranchisee.Com with documentation that indicates they purchased and own the valuable signage and that the out-of-state company was using Fox Cities Sign as part of a campaign to bully and intimidate them. The couple filed a police report for the theft of the signs, but the police say that since it’s a business-related matter the couple must hire attorneys and go after Marks in civil court. As the couple is in difficult financial straits, Marks seems to feel confident they’ll have no recourse. A board member of the Appleton Yacht Club, Marks referred to the couple’s strained finances in a text message that included a picture of Marks’ speedboat. (Marks’ sensitivity is on display at the company’s Facebook page, which includes memes mocking the homeless and Asian restaurant owners). When Marks’ procedures and tactics were described (without naming the company) on an industry discussion board of sign company owners, those with experience in sign removal said they would never enter a property without the property and sign owners’ knowledge and approval, and without proper documentation assuring them that the job was legally authorized. Some sign company owners characterized Marks’ indifferent attitude toward the seizure and destruction of others’ property as reckless at best, and illegal at worst. we do work for serveral national sign companies that hold contracts with large corps. in the paperwork they provide to us, it is clearly stated who is liable for what. Of course it all depends on state laws, but taking the sign is a tort of conversion in common law in most states… I’ve worked with repossessor firms for printing equipment. To repo in California we have to have a written order from the secured lender, with title evidence, and a licensed repo agent must oversee the repo action. We can’t enter into fenced areas or buildings without sheriff or p.d. Running on verbal info on the behalf of an unknown party is just asking to be sued. Intentional acts like that are not covered by GL Insurance. Who goes off half-cocked and does this kinda stuff without permits, written authorization and all the other legal mumbo-jumbo ?? Someone who doesn’t know what they’re doing, that’s who. I just don’t understand the need to destroy these signs as part of the original request. That alone, would send up a red flag or two. Almost always….as in always, someone wants the stuff back, even if for scrap prices. Nope, [Fox Cities Sign] acted too quickly and in a negligent manner, based on the limited facts we have thus far. My senses are always heightened when I get calls to remove signage… Anytime I’m contacted by a national company I always talk to the local location first before dispatching. Removing signs without the local owners knowledge… I would not have touched that job at all. I don’t like being sneaky about anything, I try to make sure everyone knows what I’m doing when I’m doing it so there are no surprises when I arrive. Are you a sign industry professional? Share your thoughts with a comment below. We are seeking comment from others in the sign industry – including Marks’ fellow members of the Wisconsin Sign Association – as to whether they believe that Fox Cities Sign’s practice of removing and destroying signs without the sign owner’s knowledge or permission is an acceptable industry practice. Should Small Businesses Boycott Fox Cities Sign Until They Drop This Thug-like Service? In our opinion, Jim Marks is offering out-of-state bullies an unadvertised service akin to terrorizing business owners or busting kneecaps. If a company or individual has a dispute with a business or a business owner in Central WI, if a competing business wants to cripple a competitor, or if an angry ex-spouse, former partner or disgruntled ex-employee wants revenge, they can evidently call up Jim Marks and he’ll steal and destroy the targeted business’s signs, no questions asked. If the targeted company is already struggling financially, Marks knows that he’ll get paid and the victims will have little to no legal recourse. The only flaw in Fox Cities Sign & Lighting’s lucrative service is that, for 11 years, their success has come predominantly from small business owners just like the couple they victimized. Is Jim Marks that confident that his current and future customers will agree that he appears to value money and pleasing big out-of-state companies more than he does the rights and property of local business owners? The sign industry is highly competitive. Won’t small business owners and franchisees rather give their business to sign companies who pledge not to act as predators willing to sell out local owners for a quick out-of-state check? We are interested in hearing what entrepreneurs, business owners and sign industry professionals have to say… especially those in Central Wisconsin. We are also inviting Jim Marks and others at Fox Cities Sign & Lighting to share their opinions. We’re sure, at the very least, we’ll be hearing from Jim Marks via the Sitzmann Law Firm of Appleton, WI. WHAT DO YOU THINK? ARE YOU FAMILIAR WITH JIM MARKS & FOX CITIES SIGN? DO YOU THINK A BOYCOTT IS CALLED FOR? SHARE A COMMENT BELOW. ← Will Dallas Morning News Correct This Bogus Dickey’s Franchise Story?